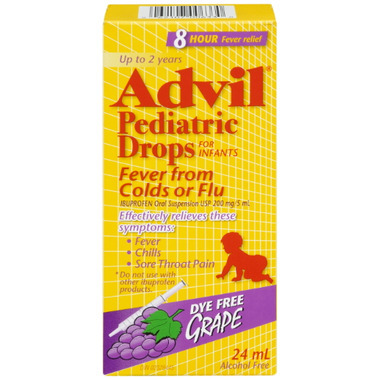 Advil Pediatric Drops provide up to 8 hours of relief for infants with fever from colds or flu. 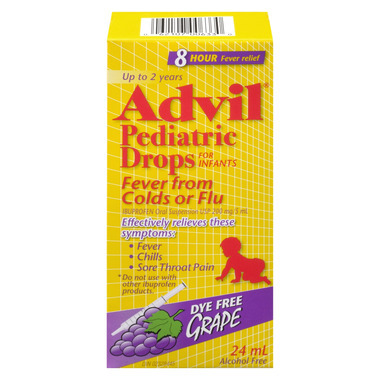 Offering a tasty grape flavour that’s dye-free, Advil Pediatric Drops alleviate symptoms of fever, chills, sore throat pain and earaches, so your little one can get the rest they need to get better. They come with a SURE-DOSE™ oral syringe for precise and easy dosing. For ages 3 months - 3 years. Non-medicinal Ingredients: Citric acid, disodium EDTA, flavour, glycerin, microcrystalline cellulose, polysorbate 80, sodium benzoate, sodium carboxymethylcellulose, sorbitol, sucrose, water, xanthan gum. Directions: If possible, weigh your child to calculate the correct dosage; otherwise use your child’s age. Shake well. Use only with SURE-DOSE™ Oral Syringe. Doses may be repeated every 6-8 hours while symptoms persist, up to 3 doses a day, or as directed by a doctor. Your child does not get any relief within 24 hours. The pain or fever persists for more than three days. Sore throat is severe, lasts for more than two days or occurs with fever or headache. Your child has had side effects (such as abdominal pain, heartburn, nausea or vomiting, bloating, diarrhea or constipation, ringing in the ears, dizziness or any change in vision, fluid retention, itching or skin rashes) from using fever reducers or pain relievers. In case of overdose, call a poison control centre or a doctor at once even if there are no symptoms.